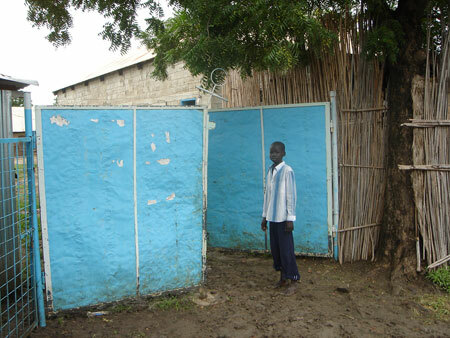 a boy stands at the blue gates outside the home of Bishop Garang of the Episcopal Church of Sudan, Malakal Diocese. Morton, Chris. "Bishop Garang's house" Southern Sudan Project (in development). 03 Jan. 2006. Pitt Rivers Museum. <http://southernsudan.prm.ox.ac.uk/details/2007.137.84/>.